The Traxxas EZ-Peak Live "8S Completer Pack" is the perfect complement to your X-Maxx 8S system. The pack includes two 4-cell 6700mAh iD LiPo battery packs for 50+mph tire-scorching 30+volt power. 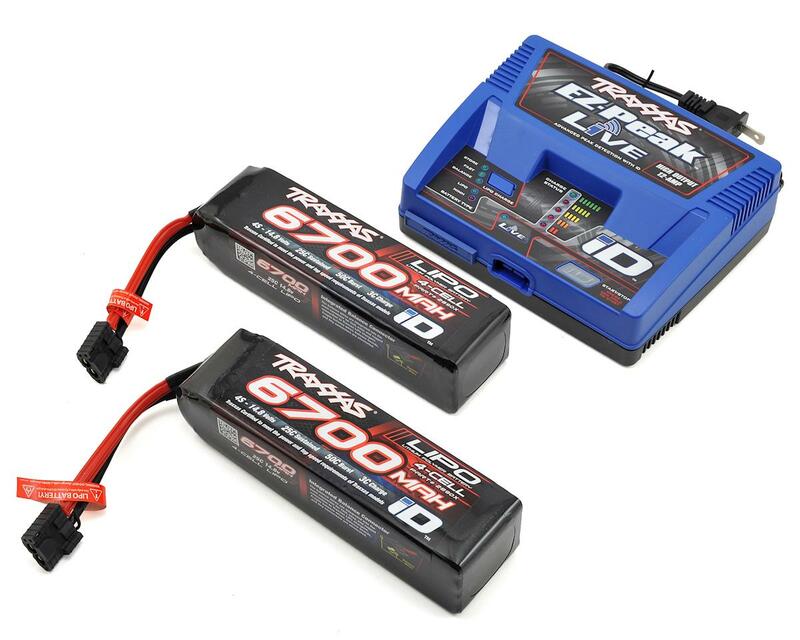 Traxxas iD batteries are the easiest and safest LiPo charging solution when used with iD chargers. You just plug in your iD battery and press start. The iD charger handles all the settings and quickly gives you an optimized charge every time. The 4s capable EZ-Peak Live multi chemistry charger comes equipped with built-in Bluetooth to work with the EZ-Peak Live app for iOS and Android. The app gives you detailed information and advanced operation through a high-definition color interface. EZ-Peak Live is the most powerful, versatile, and technologically advanced charger in the popular EZ-Peak iD lineup. The 4S LiPo delivers 6700mAh capacity and 50C burst discharge rate for power, performance, and runtime worthy of the X-Maxx. Checking in at over 30-volts in 8s configuration, Traxxas 4-cell LiPos will stand X-Maxx on its wheelie bar and have it catching massive air as fast as you can grab the throttle. Built using the same sturdy construction methods as the Traxxas 2-cell and 3-cell batteries. NOTE: Accessing some charger features requires a mobile device with Bluetooth® capability (sold separately) and the Traxxas EZ-Peak Live Application. Available here for iOS and here for Android. Not a bad kit, but why does this one only have a single charging port where literally all of the other completer packs come with a dual-port charger, and Traxxas MAKES a dual-port charger for dual 4s batteries? One star for Traxxas being a bunch of rip-off artists. The charger is GREAT! I love the bluetooth! The problem is, these HUGE EXPENSIVE 4s lipos don't fit anything besides Xmaxx! I don't see why Traxxas would shoot themselves in the foot and make this lips ONLY for Xmaxx. I have several other 4S similar Mah too. VERY disappointed. I have had nothing but good experiences with Traxxas lipo's. The subtraction of stars is ONLY because the batteries are too big! !$140 for a 1 vehicle lipo?!? No Way! !